Norway spruce (Picea abies) is a coniferous tree that will grow to 80 feet in height with a 40-foot spread. Although it is frequently used as a windbreak, its size makes it useful as an ornamental only on larger residential lots. Hardy in USDA zones 3 through 7, the Norway spruce’s ideal growing conditions include full sun and acidic, moist soil. It does, however, thrive in a wide variety of conditions, is drought-tolerant in maturity and will grow in alkaline and clay soil, as long as the roots aren’t continuously moist. Apply a fresh, 4-inch layer of mulch around the Norway spruce each spring. Keep the mulch 2 inches from the base of the tree and spread it in a 4-foot radius around it. Water your Norway spruce once a week during the summer, until mid-August. Place a soaker hose at the drip line, completely surrounding the tree, and let it run for at least one hour. 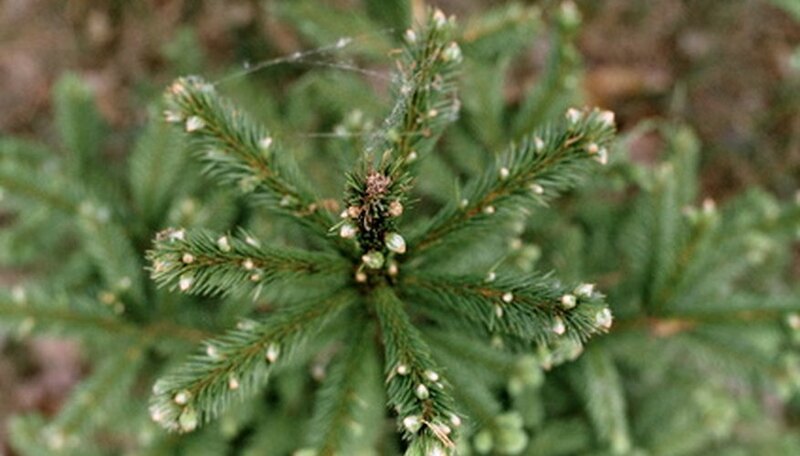 Fertilize the Norway spruce tree once a month, beginning when you see new growth in the spring. Use a 20-20-20 fertilizer at the rate suggested on the package. Discontinue fertilizing in August. Inspect the Norway spruce for mite infestations. These insects are difficult to see but if the tree is experiencing yellowing, at the base of the oldest needles, suspect a mite infestation. For heavy infestations use insecticidal soap or a commercial miticide, according to label directions.